Enjoy a relaxing, romantic getaway in the adult atmosphere of our secluded, waterfront resort. Experience our peaceful setting on 27 wooded acres with 1,100 ft. of private Sister Bay shoreline. This is the perfect spot for a honeymoon, anniversary or Birthday celebration. 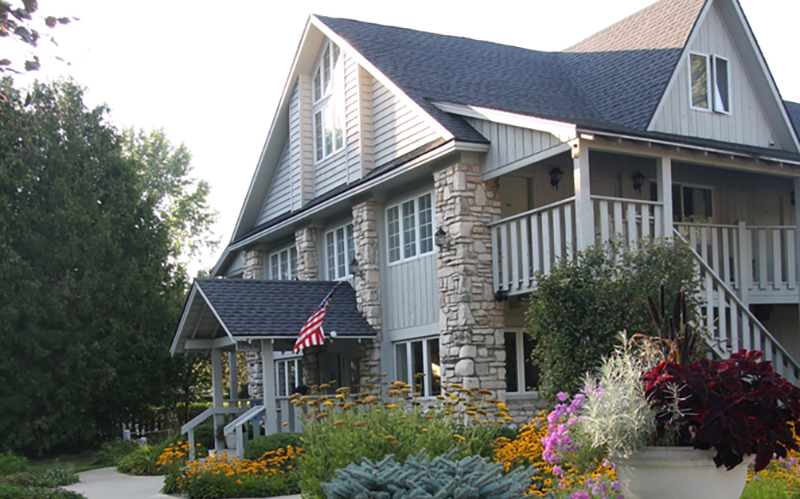 The Country House Resort welcomes adults and children 13 yrs & older. Accommodations include private water view balconies overlooking the bay, our beautiful fountains and gardens. Many of the 46 rooms & suites offer 2 person in-room whirlpools and/or gas fireplaces. Complimentary amenities include outdoor heated pool and whirlpool, kayaks, bikes, tennis court, nature trail, yard games and a European style buffet breakfast served May-Oct. Designated dog friendly rooms & suites are available by advance reservation. Located 1/4 mile off Hwy 42 and still walking distance to the village of Sister Bay. Family owned and operated. TripAdvisors Certificate of Excellence Award, Travel Green Certified. Open daily, except closed Dec 5 - Dec 25.